WELCOME HOME! FULLY REMODELED! MOVE IN READY! CITY WATER! New Roof (12/2016) New Fence (8/2015) New Hot Water Heater (2017) Hot water is also plumbed to have instant hot water everywhere in the home. 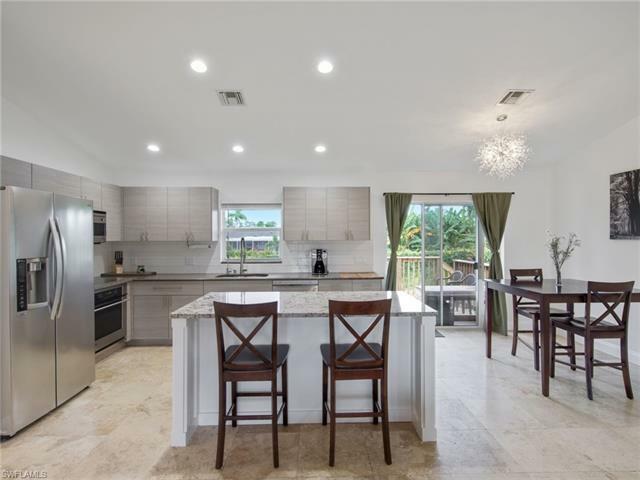 New A/C (2017) Fully remodeled island style kitchen with granite counter tops, built-in cutting board, stainless steel appliances, and gooseneck faucet for the sink. Great overhead l.e.d. lighting. Wide open floor plan. Smooth finish walls and travertine tile in the common areas. Ceiling fans in every bedroom. New carpet in all bedrooms (2017). Updated guest bath with shower tub combo and clean l.e.d. lighting. Split bedroom floor plan. Laundry room includes, stackable, front load washer and dryer and deep basin wash sink. Master bedroom suite is paradise! Master bathroom has been remodeled to include dual sinks, large vanity mirror, and spa-style shower-complete with 4 shower heads- overhead rain, waterfall, wand, and contemporary. There is a wooden deck off of the back sliding glass door, with direct access to the kitchen, perfect for grilling. Backyard has a sprinkler system and a beautiful green lawn that is completely fenced in. Two car garage offers plenty of storage!